The beacon is set, soon unexplored icy lands of New Swabia will be gradually overgrown with dense vegetation, and geothermal powerplants with other decentralized power sources will be producing energy to melt ice and for air-conditioners to function (where it will be too hot). ☹ United — it is the unity to solve business of those, particularly, whom they concern, alike to as it used to be that village community gathered, “Sbor” (according to Alexey Stepanovich Khomyakov) According to Khomyakov, sobornost rejected the concept of “personal happiness”, arguing that “it is impossible to be happy alone”. The new version of the Unity allows you to be happy even in solitude (only one has to gather alone in this case). In addition, not only males (as it was before) are allowed to a new unity, but also females, shemales and other creatures capable of informative communication (the emotional contact at such a gathering, once recognized by the participants, is immediately limited in time, according to the general decision of the audience). Solar — it means that the only object in this star system in front of which the “Ussrussians” are ready to bow their heads is a G2V class star, called in Russian by the Sol(un)che, ☉. To put it more simply, “Rusunsians” are sun worshipers, and all other astronomical objects of the system (for example: the moon ☾, Mars ♂, Venus ♀, Jupiter ♃, Mercury ☿, etc) are treated with respect, but they are not obliged to bow to them (although to the Sun no one is obliged to bow either, it is enough to recognize the gravitational heliocentricity in this stellar system). As for the planet Earth, ♁, for “russians uss” - it is the home, the motherland, the mothership. That is, a house in which, wherever they wander - they will always be able to return, where they will always be happy with their relatives. Satanists — on behalf of the heroine of the Nart folklore epic of Satana (in the Armenian tradition Satenik, Սաթենիկ), among the Nart girls she had no equal in beauty, from the light of her face a dark night turned into a day, and her words were sharper than a sword and more direct than sunlight. Satana is a generous hospitable mistress, who repeatedly rescued narts from starvation and other ills. Wearing masculine armor, she fights like a warrior, nothing escapes her eyes and the celestial mirror, with which she finds out everything, sitting in a seven-storey tower. Or, in simple terms, as the russian proverb says: “Wife and Husband - Same Satan”. 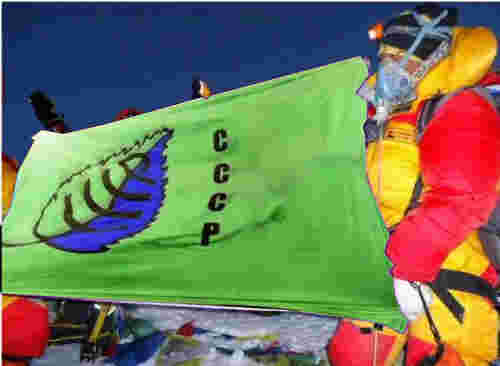 The emblem of the new version of the USSR is a leaf of any tree, green-blue, symbolizing thick, dense forests and clear bottomless reservoirs (or blue and celestial distances - whichever you like more, to whom that is closer or further). Distributed under the Creative Commons license without mandatory attribution, for commercial / non-commercial use, without the need for notice when editing and making changes to the distribution process. Model your own USSR, share it with others!